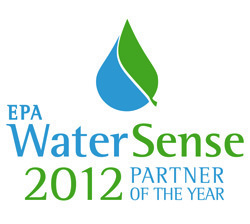 The US EPA announced it 2012 “WaterSense Partners of the Year for 2012” awards in early October. WaterSense is an ambitious program planned and carried out by the EPA that is aimed at saving water. Since the launch of WaterSense in 2006, WaterSense labeled products have, according to the EPA, “helped Americans save $4.7 billion in water and energy bills and 287 billion gallons of water.” That’s due to the efforts of more than 2,600 WaterSense partners who have brought more than 5,000 different models of WaterSense labeled products to market and educated thousands of consumers on the benefits of WaterSense labeled products, new homes and services. The 2012 Partners of the Year represent the best of WaterSense’s partners. They are recognized for efforts made to increase water efficiency and awareness of the WaterSense program and its objectives. American Standard Brands earned a Manufacturer Partner of the Year Award for developing a WaterSense-labeled toilet model that can be installed without tools. American Standard also toured the country with an educational display that demonstrated how WaterSense-labeled faucets, toilets and showerheads work. Kohler Co., now a three-time WaterSense Manufacturer Partner of the Year, introduced its most water-efficient dual-flush toilet in 2011. Kohler also more than doubled the number of WaterSense-labeled showerheads it offers and supported and participated in the “Wasting Water Is Weird” consumer education campaign to promote water conservation. Lowe’s Companies, Inc. became a three-time WaterSense Retailer Partner of the Year by supporting and participating in the “Wasting Water Is Weird” campaign to promote water conservation and training their sales associates on water savings and usability of WaterSense labeled products. Through their efforts, Lowe’s customers saved about 4 billion gallons of water in 2011 with WaterSense products. Colorado Springs Utilities was named the WaterSense Promotional Partner of the Year for helping a local builder create the first WaterSense-labeled home in Colorado. The utility also encouraged commercial kitchens in the area to try pre-rinse spray valves that helped save more than 20 million gallons of water. KB Home, now a two-time WaterSense Builder Partner of the Year, built nearly 100 WaterSense-labeled homes in 2011 and pushed the limits of sustainable building with a model home designed to achieve net-zero energy use and the highest levels of water and other resource efficiency. For full details of the accomplishments of the winners above and other businesses and organizations that were also recognized by the EPA, read the EPA’s press release. Learn more about the WaterSense Awards Program, including information about past winners.